The troops of the Finnish Army of the Isthmus repelled all breakthrough attacks by the Red Army at the main Finnish defensive line, i.e. the Mannerheim Line. 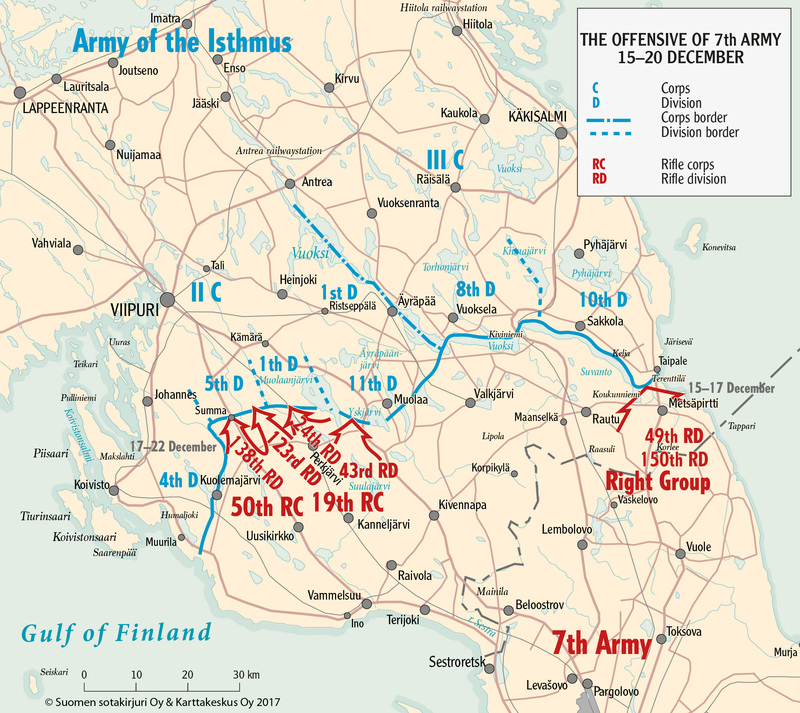 The hardest defensive battles of December 1939 were fought in the areas of Taipale and Summa. A counteroffensive launched by Finnish forces in front of Summa on 23 December ended in failure. The last unsuccessful attempt by the Soviets to break through the Mannerheim Line started in the Taipale area on 24 December. The Red Army’s attacks on the Karelian Isthmus ended in the Kelja area on 27 December. The troops of the Finnish Army of the Isthmus repelled all breakthrough attacks by the Red Army at the main Finnish defensive line, i.e. the Mannerheim Line. The hardest defensive battles of December 1939 were fought in the areas of Taipale (Solovyovo) and Summa. A counteroffensive launched by Finnish forces in front of Summa on 23 December ended in failure. The last unsuccessful attempt by the Soviets to breach the Mannerheim Line started in the Taipale area on 24 December. The Red Army’s attacks on the Karelian Isthmus ended in the Kelja area on 27 December. The first mission of the 7th Army, subordinate to the Leningrad Military District, was to advance to the general vicinity of the Viipuri (Vyborg)–Antrea (Kamennogorsk) Railway Station–Hiitola (Khiytola) line within approximately two weeks. The attacking army (7th A) was commanded by Army Commander 2nd Rank V. F. Yakovlev. He was replaced on 9 December by the commander of the Leningrad Military District, Corps Commander 2nd Rank Kirill A. Meretskov. At the same time, command of the war on the Finnish front was transferred to the Stavka, i.e. the Supreme Command of the Red Army. The Red Army’s two rifle corps (19th RC and 50th RC) and infantry reserve comprised a total of ten rifle divisions. In December, the army was further reinforced with two rifle divisions. The army’s third army corps was a tank corps (10th TC). Another formation formed under the command of the Leningrad Military District on the Karelian Isthmus was the I Corps of the Finnish Democratic Republic. This army corps did not participate in actual military operations, instead operating at the rear of its own forces. The armys attack was also supported by the Ladoga Flotilla. The operations of the various Soviet naval units up to Koivisto (Primorsk) in the Gulf of Finland and up to Taipale on Lake Ladoga were inefficient. The Army of the Isthmus, which was commanded by the commander of the peacetime army, Jaeger Officer, Lieutenant General Hugo Österman, comprised two army corps. They in turn comprised five divisions of the field army in total. The majority of the covering forces had been formed into a reserve division for the army. The II Corps (II C) , which was commanded by the commander of the peacetime army corps, was deployed on the western Karelian Isthmus, while the III Corps (III C), commanded by peacetime Inspector of the Infantry, Jaeger Officer, Major General Erik Heinrichs, was deployed on the eastern Karelian Isthmus. Army of the Isthmus. On the eastern Karelian Isthmus, Heinrichs’ army corps comprised two divisions (8th D and 10th D). One division (6th D) was deployed behind the Isthmus as the commander-in-chief’s reserve. Four groups formed of the covering forces (the Uusikirkko (Polyany), Muolaa (Pravdino), Lipola and Rautu (Sosnovo) Groups) were deployed in the area between the main defensive line and the Finnish-Soviet border. The coastal artillery forces (Koivisto sub-sector and Isthmus sector) subordinated to the Army of the Isthmus repelled all attempted attacks by the naval units of the Red Army on Lake Ladoga and in the Gulf of Finland. The Soviet 7th Army (7th A) launched its offensive across the width of the Isthmus on 30 November. The army’s commander was Army Commander 2nd Rank Vsevolod F. Yakovlev. According to the order issued to him by the Leningrad Military District, his army had to advance to the Viipuri–Käkisalmi (Priozersk) line within 12 to 15 days. From there, the troops were to continue advancing towards Helsinki, which, according to the plan, was to be reached within a week, i.e. three weeks from the start of the attack. The attack was divided into three phases on the Karelian Isthmus. In the first phase, the troops had to reach the main Finnish defensive line within four to five days. In the second phase, they had to breach the main Finnish defensive line (Mannerheim Line) within four to five days. In the third phase, after breaking through the line, the troops were to give chase, i.e. follow and destroy the Finnish forces pulling back from the main defensive line. This phase was estimated to take three to four days, after which the forces would reach the Viipuri–Käkisalmi line. The attack on the western Karelian Isthmus was carried out by the 19th Rifle Corps (19th RC), led by Division Commander Fyodor N. Starikov. It comprised three rifle divisions and a tank brigade. In addition to the army corps’ and divisions’ own artillery units, the offensive was also supported by three artillery regiments assigned from the supreme command’s reserves.The first goal of the army corps was to reach the Vuottaa–Kivennapa (Pervomayskoye) line. The eastern Karelian Isthmus was attacked by the 50th Rifle Corps (50th RC), commanded by Division Commander Filipp D. Gorelenko. It comprised two rifle divisions and a tank brigade. The army corps’ attack was supported by its own artillery as well as two artillery regiments assigned from the supreme command’s reserves. The first goal of the army corps was to reach the Metsäpirtti (Zaporozhskoye)–Rautu–Lipola line. The tank corps (TC) was the army’s reserve. The plan was to deploy it wherever the army corps achieved its first breakthrough of the main Finnish defensive line. After one of the two rifle corps achieved a breakthrough, the army corps’ mission was to advance deep behind the Finnish lines through the breach. On 1 December, the commander of the Leningrad Military District, Corps Commander 2nd Rank Kirill A. Meretskov, issued a preparatory order to the 7th Army to shift its focus to the eastern Karelian Isthmus. A new military group, called the 7th Army’s Right Group, was established there at the military district’s order on 3 December. Corps Commander Vladimir D. Grendal, who had arrived on the Karelian Isthmus in the role of an artillery inspector, was appointed the group’s commander. He was of Finnish descent. In addition to the rifle corps (50th RC) already deployed in the area, the group was also assigned two rifle divisions by the army. A wounded soldier being prepared for medical transport in Taipale during an artillery barrage in December 1939. SA-kuva. The Right Group’s troops were the first unit off the 7th Army to reach the main Finnish defensive line on the eastern Karelian Isthmus. The aim of the group under Grendal’s command was to quickly advance across the waters of the Vuoksi (Vuoksa) River, Lake Suvanto (Sukhodolskoye) and the Taipale (Burnaya) River in both Kiviniemi (Losevo) and Taipale (Solovyovo). The offensive by the Right Group was launched in both areas with the strength of two rifle divisions on 6 December. The troops who attacked in Kiviniemi failed to advance to the northern bank of the Vuoksi River and Lake Suvanto. The forces of the two rifle divisions that attacked across the Taipale River made it to the opposite bank of the river and to the Koukkuniemi Peninsula. Counterattacks launched by the Finns to defeat the enemy forces that had reached across the river were unsuccessful. Soviet forces advanced to the front of the main Finnish defensive line, but their attempts to breach it were unsuccessful. When the Main Command of the Red Army, i.e. 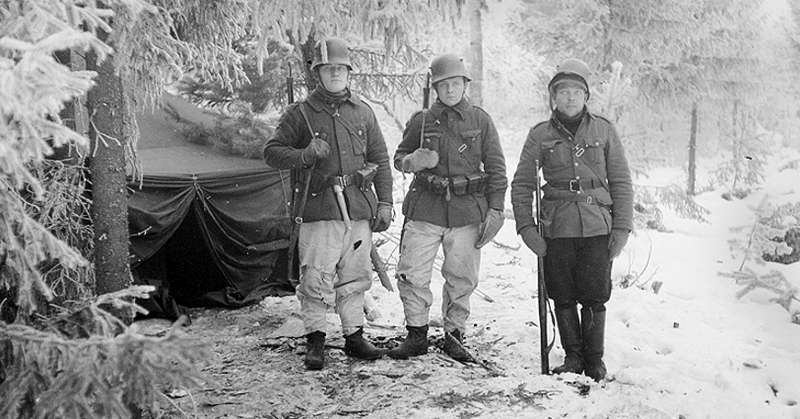 the Stavka, assumed command on the Finnish front on 9 December, three key individuals became responsible for making the everyday decisions pertaining to the war. They were Kliment Voroshilov, the commander-in-chief of the Red Army, people’s commissar for defence and marshal of the Soviet Union; Army Commander 1st Rank Boris Shaposhnikov, the chief of staff of the Red Army; and General Secretary of the Central Committee of the Communist Party Joseph Stalin. On the same day, the 7th Army, now under Meretskov’s command, issued an order for the army’s main focus to be shifted to the western Karelian Isthmus. Accordingly, a rifle corps (50th RC) that had been deployed in the Kiviniemi area on the eastern Karelian Isthmus was relocated to the western Karelian Isthmus. 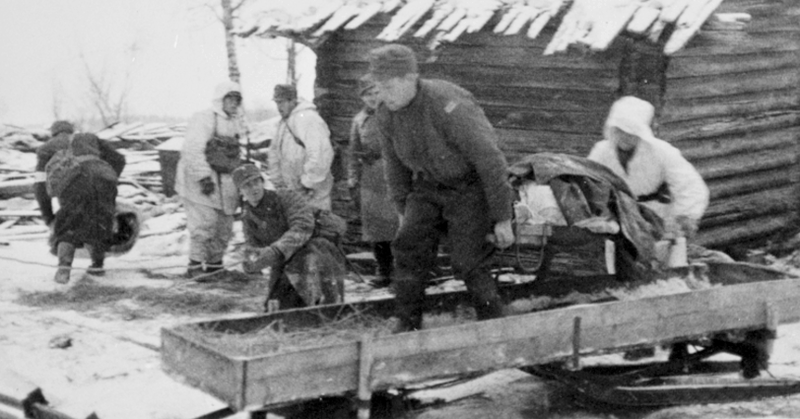 Finnish soldiers of the Summa sector in front of their tent on 14 December 1939. SA-kuva. On the western Karelian Isthmus, the main forces of the 7th Army reached the Mannerheim Line on 10 December. At this point, the combat troops comprised a little over 247,000 personnel of the army’s total strength of over 265,000 personnel. Meretskov planned a breakthrough attack on both sides of the Isthmus. The troops’ deployment was focused on the western Karelian Isthmus. The mission of the two rifle corps (50th RC and 19th RC) attacking this area was to take Viipuri. On the eastern Karelian Isthmus, the Right Group’s mission was to occupy Käkisalmi and advance to Hiitola. The group had two rifle divisions (49th RD and 150th RD) as well as other units at its disposal. A rifle division (43rd RD) was concentrated in the vast area between the two areas of attack. Its mission was to advance up to Lake Äyräpäänjärvi (Bolshoye Rakovoye). 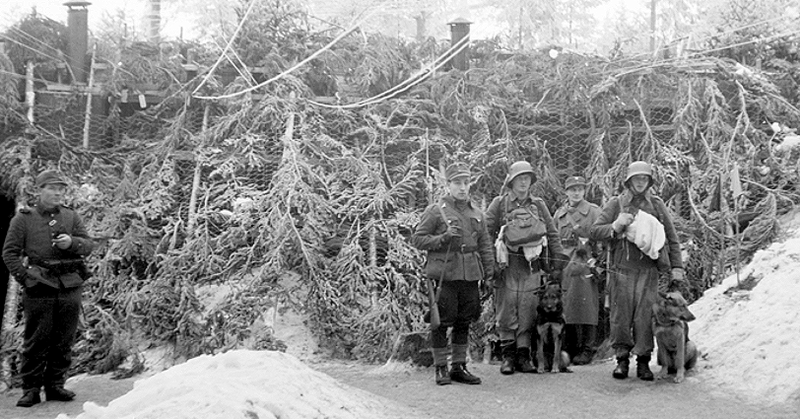 Finnish soldiers of the Summa sector in front of a camouflaged concrete bunker on 14 December 1939. SA-kuva. The staggered breakthrough attacks started in the Taipale area on 15 December and then in the area between Summa and Lake Muolaanjärvi (Glubokoye) on 17 December. In the Taipale area, the Soviet forces already started to lose their offensive strength on the third day. At the time, the attack between Summa and Lake Muolaanjärvi was only just beginning. These Soviet offensives also wound down on 22 December. The Mannerheim Line held. After repelling the attack by the enemy army, the Army of the Isthmus received permission from the General Headquarters to attempt a counteroffensive in the area defended by Öhquist’s army corps (II C), between Kuolemajärvi (Pionerskoye) and Perkjärvi (Kirpichnoye). In addition to its own troops, Öhquist’s army corps was also assigned a division from the commander-in-chief’s reserve. The counteroffensive began on 23 December. The assault troops advanced slowly, and Öhquist called off the offensive the same day. The assault troops were ordered to return to their starting points. The offensive had failed. Some later referred to the counterattack as ‘hölmöntölväys’ (a fool’s errand). The enemy assessed that the counterattack’s purpose had been reconnaissance. However, the Soviet military command cancelled the offensive on the Summa area, which had been included in Meretskov’s planned third breakthrough attack. The attack was only launched in the Taipale area. The 7th Army’s third and last attempt to breach the Mannerheim Line in December started on Christmas Eve. The new rifle division that had been concentrated on the front in the area increased the number of rifle divisions at the Right Group’s disposal to four. The main focus of the group’s attack was still in the Taipale area. The troops of the 10th Division, temporarily under the command of Colonel Aarne Blick, repelled the attack by the two rifle divisions at the front line. The enemy’s third rifle division advanced across the frozen Lake Suvanto. Its units were able to make their way to the shore behind the Finnish troops. These enemy divisions were defeated with counterattacks in the following days. The last of the attacks was launched in the Kelja area on 27 December. Towards the end of December, the 7th Army of the Soviet Union shifted to a defence formation on the Karelian Isthmus. The Soviet military command decided to concentrate more troops on the Isthmus. The Red Army began attack preparations on the Karelian Isthmus that lasted approximately a month.